hehe. nice to see a festive Biff. pssst…the secret is in the batter… he must have left out the dash of evil. Mmm. Gingerbread is for eating. Not living. 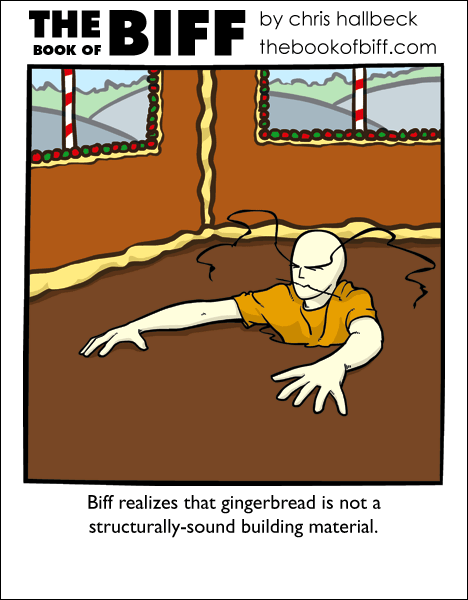 I think Biff’s only mistake here was moving in too quickly.. I’ve tried gingerbread off a gingerbread house after it was like a year old or so…… I think it’d rival brick in terms of structural soundness..
my latest gingerbread house exploded in a fiery rage >_>. Thats why on small scales gingerbeead works, on large scales it dont… you need a lot more support beams. or perhaps biff’s been eating his house? At least eating his house is better than eating a relish, ketchup, olive, mustard, mayannaise, horseradish, onion and cracker sandwich. Burning down gingerbread churches. So damn METAL! I threw a four year-old gingerbread house at someone, it gave them a concussion. is biff falling into his gingerbread basement? I’m sure it would be delicious. Surgeon General’s warning: Eating houses may be hazardous to your health. he stood there, mezmerized by it. it was a house of gingerbread CARDS. with icing numbers & crude pictures. and warm icing… to hold.. it…together…. man i miss that house. so freaking GOOD! me and 5 friends to make it. Seriously. I coudn’t think of directions when planning it out, only Tuesd…..
I’m rather liking Biff in orange and yellow! Warm colors work to my eyes! But it sure is a tasty one. @Xim: What the hell, man? XD i’ve been giggling like an idiot at that for an hour. You have to give details now. You made me hungry, mao.